Deepak Chopra: "Before particles and waves are observed they exist as transcendent potentia in the field. The field interacting with its own self creates particles waves and the physical world. The field is non physical transcendent. It is a field of possibilities. Your core consciousness is the field." 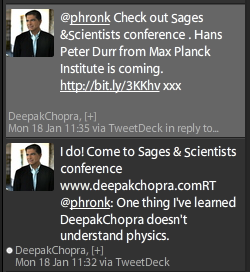 Me: "One thing I've learned from Twitter is that Deepak Chopra doesn't understand physics." Deepak Chopra: "Yes I do. Come to my $2000.00 conference." A word of explanation: I have nothing against Deepak Chopra personally, and I appreciate him taking the time to reply to my remark. I am convinced that he is genuine in his beliefs and truly wants to help people. The problem is that many of his beliefs simply don't correspond to reality. It's like he gained a basic understanding of quantum physics, then made up a bunch of stuff out of thin air to connect it with his own (also made-up) ideas about consciousness. When fantasy is allowed to slip into beliefs, you end up washing your eyes with the spit off your toothbrush. If you read Chopra's Twitter stream, a lot of it ends up sounding like The Sphinx from Mystery Men; deep-sounding but ultimately shallower than a puddle of toothbrush spit. Spirituality is important. I love that Chopra endorses exploring the intersection between spirituality and science, because the two need not be mutually exclusive and the world would be better if we tore down that wall. But presenting tentative spiritual guesses as scientific facts does measurable harm. I'm glad he was at least open to my speaking out against it. "Transcendent" is a dangerous word. More scientific terms like "uncertain" and "random" aren't any less vague but "transcendent" comes with an aura that makes people go "Ooooo... let's stop thinking and enjoy this moment -- before making our way to the merch table." Haha, so true. And it's all about the merch table ain't it? For all his talk about rising above the material world, Deepak Chopra has millions of dollars worth of material possessions. 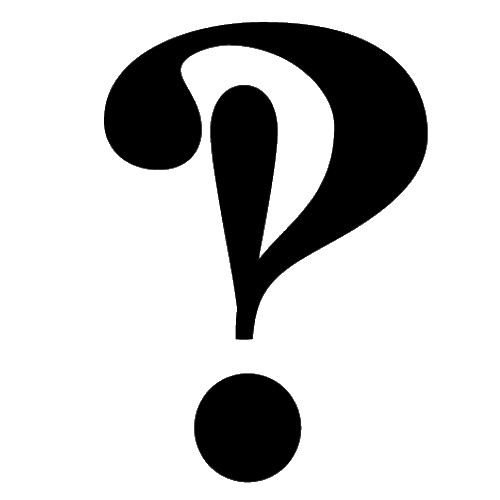 Wait, so the stuff I read in Dan Brown's The Lost Symbol could be all wrong? I think if you knew more about Deepak(ets -- Deep Pockets), I think you would have something against him personally. Am I to understand that people will actually make up physics-bending scenarios in order to support their own personal beliefs? I've got to tell my pastor about this! DR: Haha, haven't read it yet, but I'm much more likely to trust that noetic science research than Deepak. Widsumb: Yeah, the more I read about him, the more I want to take back my "he probably means well" assertion. Jay: It's almost as if we can't trust everything we read.